Orlando Timeshare Promotions and Resort Vacation Packages for you and your family to preview and experience the top Timeshare Vacation Resorts in Orlando Florida. Stay at one of the participating Orlando Timeshare Resorts, and save money while you and your family experience Orlando vacation accommodations at their best. We invite you to enjoy these Orlando Resort Accommodations at discounted rates, by attending an informative 90-minute to 2-hour sales presentation offered on-site at the resort of your choice. During the sales presentation, a vacation consultant will give you and your family a private tour of the resort of your choice, and will provide you and your family, all the information pertaining to the way you could use and benefit from this program, as well as the facts about becoming an owner or a member. Resorts usually provide on-site supervised child care facilities for families with children between 3 and 12 years of age. Breakfast is often provided for the entire family on the day of the tour. In Orlando, these Timeshare presentations are often offered by the resorts during morning hours, so after the presentation, you and your family can proceed to enjoy the rest of the day at the Orlando Theme Parks. It is important to know that you attend this Timeshare presentation without any obligation other than complete the required length of the Timeshare tour; all resort developers ask, is that you and your spouse attend the tour presentation with an open mind. Save big on your Orlando Vacations, and discover the magic and enchantment that this wonderful destination has to offer. When visiting Disney World, don't miss the opportunity to experience Timeshare resort accommodations at its best. Silver Lake Resort, a magnificent vacation resort for the entire family, is located only 2 miles from Disney World and only 10 minutes to the other main theme parks in Orlando. Choose from comfortable studio units to spacious two bedroom grand villas that sleep up to 8 people. Some villas offer fully equipped kitchens and jetted tubs. Guests enjoy a scenic lakefront setting, numerous swimming pools, waterspouts, basketball and volleyball courts, and a full schedule of family activities. 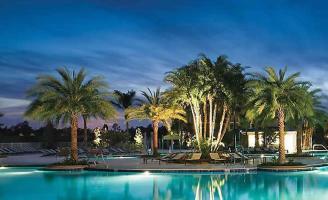 Preview Vacation Package at Calypso Cay Resort in Orlando Florida near Disney World. Enjoy your stay in a comfortable hotel room, or in a one, two or three bedroom condo, at this great Vacation Resort in Orlando FL. Experience its great and "Fun for the whole family" facilities. Located just off the world-famous International Drive, Westgate Palace is in a class by itself. Beginning with the elegantly decorated lobby, the two-towers vacation resort feature 408 lavishly appointed villas with fully equipped gourmet kitchens and a spectacular view of the surrounding area. Enjoying a family vacation in Orlando Florida is an experience of a lifetime. Approximately 62.7 million people visit the Orlando Theme Parks every year. Thousands of accommodation facilities are available for the visitors, but the one segment of the vacation industry that has become extremely popular is the Vacation Ownership Resort also known as Timeshare Resort. We offer you discounted Orlando Timeshare Promotions with the intention to introduce you to this great concept of vacation ownership. Attend an informative 2 hour timeshare preview presentation and enjoy these great savings. Orlando Timeshare Promotions are an economical alternative to a family vacation, in particular the ones sponsored by the local Timeshare companies. This is a one time opportunity to experience this popular way of vacationing known as Vacation Ownership or Timeshare Vacation. Over 9.2 million people own a Timeshare Product at a vacation destination around the world.